people who now hunt her. finds he can’t complete his assignment. intends her to be? Failure will condemn the world to eternal darkness. 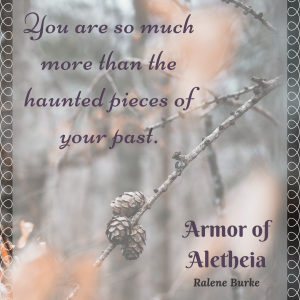 Magic, romance, danger, Aletheia has it all. This fantasy by Burke follows the traditional fare the likes of J.R.R. Tolkien and Terry Brooks. Fantasy fans, you don’t want to miss out in this one! ~Morgan L. Busse, award-winning author of the Follower of the Word and The Soul Chronicles. 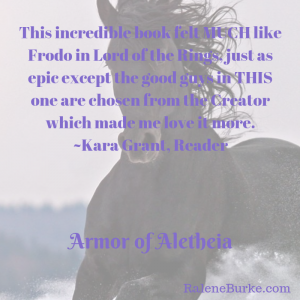 Want to see some of the inspiration behind the amazing people, places, and creatures in Armor of Aletheia? 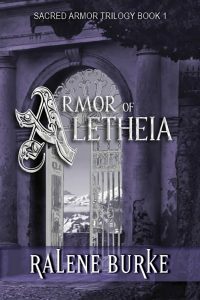 Check out the ARMOR OF ALETHEIA PINTEREST board! First 500 words … Enjoy! “By all that is created!” Karina Dubrev bit back the rest of the curse, plopped in a chair, and hunched over her throbbing fi­nger. Several strands of dark hair fell across her hand, and she pushed the lock back before it could slide across the wound. “Watch your words, Karina.” Her mentor, Jace, pierced her with a disapproving look. She chose not to respond. Instead, she reached over to the table and dipped her hand in a shallow container. The offensive green concoction smelled of honey and the aptly named Scorch flower—sweet and nauseating at the same time. She smeared on the ointment and wrapped her ­finger with a clean cloth, then stood to smooth the wrinkles from the dingy apron covering her deep-blue dress. “Please keep an eye on the tincture in the pot, Karina. We cannot let it burn.” Jace’s gentle warning was no less authoritative—like a stern master who would not be denied. She tried to pay attention, but she wanted to do something more active, like picking herbs or mixing ointments, not watching a black pot boil. The single window adjacent to the ­replace let in the last light of day. Sinking below the mountains, the sun cast halos around the towering peaks. How much time had passed since she had started helping Jace restock medicines? Her gut clenched. She stole a glimpse at the elderly man hovering over a table loaded with the various bowls and utensils used in their healing craft. Did her master realize what time it was? “Karina!” A familiar, shrill voice shouted from the open door. She closed her eyes, breathing deeply. Obviously, too much time had passed. Karina dared to exhale, then turned. Queen Anaya of Aletheia stood in the doorway, hands on her hips, her porcelain face puckered, her blond curls piled atop her head. ‑e purple jewels in her crown matched her purple and silver gown. She quirked an eyebrow and waited. She nodded and shuffled after Queen Anaya, who silently led Karina through the labyrinth of the royal house to the dining hall. Be the first to know about future releases by signing up for my newsletter! You’ll get my monthly newsletter (plus occasional announcement emails), which focus on encouragement, speculative fiction, and all things that #SHINEBeyond!